Anne Kajir won a precedent-setting lawsuit on landholder rights against a global timber company that conducted large-scale, illegal logging in the largest remaining intact block of tropical forests in Papua New Guinea. Attorney Anne Kajir uncovered evidence that widespread corruption and complicity in the Papua New Guinea government had allowed rampant, illegal logging, which was destroying the largest remaining intact block of tropical forest in the Asia Pacific region. In 1997, her first year of practice, Kajir successfully defended a precedent-setting appeal in the Supreme Court of Papua New Guinea, which forced the logging industry to pay damages to indigenous land owners. Kajir has served as chief executive officer of the Environmental Law Centre in Port Moresby and was the lead attorney in a Supreme Court case aimed at stopping foreign timber companies’ large-scale, illegal deforestation practices, often accompanied by threats of harm to local landholders who dare to challenge them. Timber has historically been a corrupting force in the politics of Papua New Guinea, whose government has long-standing, lucrative relationships with timber interests. Although the country’s constitution guarantees the land rights of traditional communities living in the forest, the reality is far different. Kajir found evidence of widespread government corruption that allowed logging companies to act as a law unto themselves, ignoring the terms of the government-issued timber permits, and terrorizing the local communities – at gunpoint in some cases – into signing over their land rights. Kajir has faced considerable personal risks in her years of posing legal challenges. She has been physically attacked more than once, and robbers forced their way into her home to steal her computer, which had files on all her legal cases. Since the 1980s, industrial logging has severely depleted and damaged PNG’s tropical forests. Malaysian companies dominate the business, led by Rimbunan Hijau, a multinational timber conglomerate with logging operations in China, Brazil, Cameroon, Equatorial Guinea, Australia, New Zealand, Vanuatu and Papua New Guinea. Forestry experts consider Rimbunan Hijau one of the most damaging and irresponsible global logging companies. Besides controlling 80 percent of logging in PNG, Rimbunan Hijau also owns one of the country’s two national newspapers. The current executive and legislative branches of the government fully support the logging industry, and particularly Rimbunan Hijau. The government’s support has only weakened landholder rights. In 2005, a forestry bill was introduced that stripped language that had guaranteed consent of landowners as a requirement for timber permits; it also removed the “NGO seat” on the National Forest Board and replaced it with a seat for the timber industry. Many NGOs and legal experts in PNG believe that the revised bill violates protections and rights embedded in the country’s constitution, in stark contrast to PNG’s reputation for pro-ecological constitution and sound environmental laws. Anne Kajir, receiving her award at the 2006 Goldman Prize ceremony. Anne Kajir, accepting her award at the 2006 Goldman Prize ceremony. Anne Kajir (left) and ELC colleague. Anne Kajir leading community workshop. 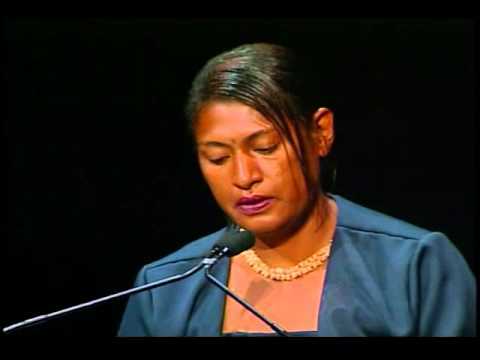 Anne Kajir, winner of the 2006 Goldman Environmental Prize, Islands and Island Nations (Papua New Guinea).